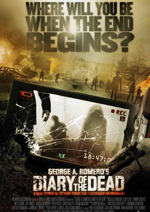 flashzombies.com - "Diary of the Dead"
If you are a George A. Romero fan, and also love watching youtube videos, this movie is for you. Starts out as a bunch of college kids are making a mummy movie with there professor in the woods. They stop shooting after someone alerts them to news on the radio. You get to hear the old Night of the Living Dead radio recording. "Medical authorities in Cumberland have concluded that in all cases, the killers are eating the flesh of the people they murder." Great line. So they all decide to get out of the woods and go home. 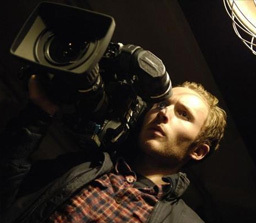 While Jason records everything, if anyone will survive to even watch it. We the viewers watch basically through Jason's viewfinder. Reminded me a bit of cloverfield. I think Romero did a better job at it. It's a good idea to capture different generations and make a series grow. I do hope Romero makes many more zombie movies. His craft make's them enjoyable to watch and rewatch. Even though this movie was low budget, it still had Romero class to it. Back to the story! Everywhere this small group goes, someone ends up bitten or dead. Always a good idea to stay put, with supplies of coarse. Greatest part of the movie is when the crazy deaf amish guy throws explosives at the horde of zombies they they blow up into zombie pieces. Never thought i'd see that in a zombie movie. Sadly the crazy amish guy doesn't make it out. The rest escape, and goto the house of one of the actors from the film. Ridley was the star, who played the mummy, a rich kid with a huge mansion. In the back yard of this house, he kept zombies in a pool, they were moving around, pretty funny. Ridley was bit, and soon he became a zombie and once again someone dies and they all hide in the safe room. Mansions have safe rooms, everyone knows that. Won't say any more about this movie, you will have to see it yourself. But one additional note, i've read a few other reviews for this movie and people gave romero crap, this movie was good, fun zombie movie with surprises. Critics know nothing. Overall I will give this movie a 7/10. What do you think of this movie? 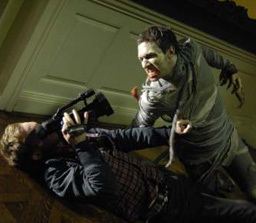 Click here to discuss Diary of the Dead (2007) in our forum.